Termiwatch is basically a DIY termite activity detection and monitoring kit that will give you an early warning of any termite activity before it escalates and does damage to your home. The basic premise of Termiwatch is that a planned system of very palatable (for termites!) wooden baits are buried around the perimeter of your home. These baits are placed at strategically separated distance so that foraging subterranean termites will come into contact with them. The baits themselves won’t attract termites to your home from down the street, they will be found only by coming across them during their normal foraging. Termiwatch termite detection system is based on a globally proven methodology that protects nearly 4 million homes, offices and other structures around the world. Termiwatch uses a specially cultivated Australian bait timber that is rich in cellulose and is held in place underground by special, robustly designed plastic stations buried just under the surface at a depth where we know termites will be foraging. Termiwatch provides a quick, simple way to visually inspect whether termites have been active at a particular station and if so, we can then assist in developing a plan to eliminate those termites present either by spot treating or a more permanent barrier solution. Note that as well as planning and installing a commercial Termiwatch system, Perth Pest Control can also offer a regular monitoring service which may save you time and money in having to allocate personnel to this necessary activity. 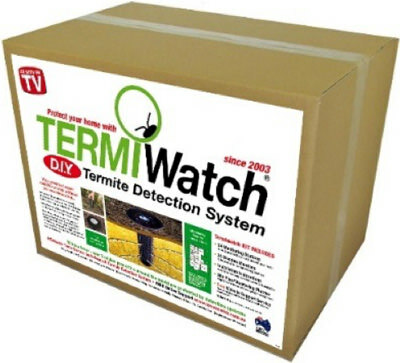 More specific details on the Termiwatch termite detection and monitoring system, as well as the facility to purchase online, can be found on our dedicated Termiwatch website HERE. 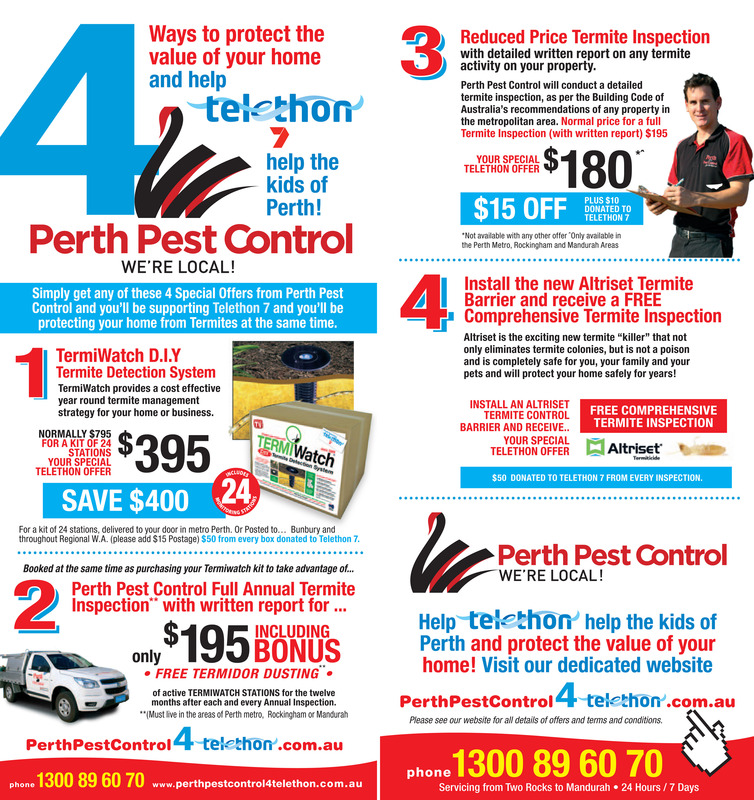 Perth Pest Control, with the assistance of its home developed Termiwatch product, has been great supporters of Telethon for many years. In fact a portion of all our sales is donated to the Telethon Foundation and we sincerely applaud them for all their efforts in the medical and numerous other areas in which they provide valuable assistance in Western Australia. We have even set up a “Perth Pest Control for Telethon” website that can be accessed HERE. Want to see the terrific offers we have in conjunction with Telethon?